Shop for pet grooming and hygiene supplies. 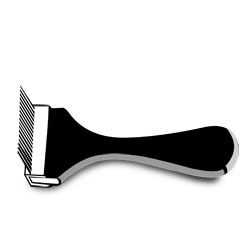 Browse popular grooming products like the furminator, zoom groom, and Wahl clippers. The furminator is a deshedding tool that reduces loose fur from shedding up to 90% with regular use. It has a button that quickly and easily releases collected fur. It has an ergonomic handle for comfort and ease of use. The zoom groom removes loose fur like a magnet and it stimulates capillaries and natural oil production. It also massages while you brush. 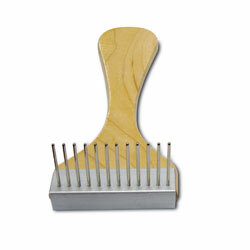 This tool also effectively reduces shedding with regular use. Human and dog clippers can look the same but they are different. It is not advised to use human clippers on pets. The blade teeth are usually closer to each other than dog clippers. Using human clippers on pets could result in jamming which could cause discomfort in your pet. Human clippers also lack the speed to pass through thick fur. Dog clippers are made of heavier metal and are sharper. There are typically more blades to choose from for dog clippers. They vary blade lengths. Shop classic dog brushes like the slicker brush and flea combs. Find other cleaning products here such as the pooper scooper. Buy your grooming and hygiene products here at Med-Vet International. Pet Fleakom Nylon, 3 1/2"